Today I will be placing flowers on the grave of George Melvin Miller, and his father, Hulings Miller. When was the last time anyone visited these graves? 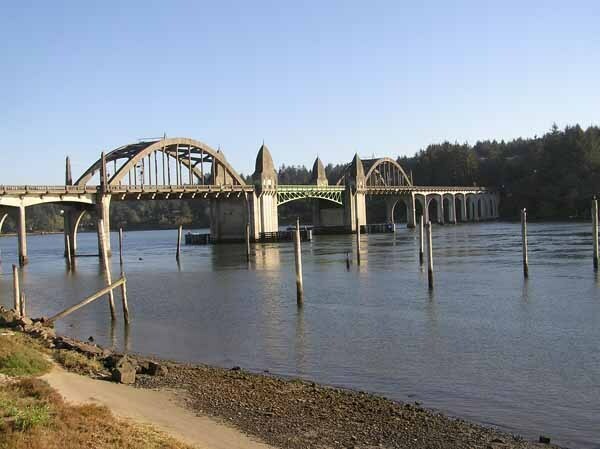 George declined to have a plaque honoring him attached to the Siuslaw River Bridge in Florence, Oregon. It was his baby, his dream to connect Florence and her Rhodies to the City of New York. George was titled ‘The Prophet of Lane County’. In the late fifties, we Presco children would give Georges niece a call. Juanita Miller was known as the ‘White Witch’. She lived close by in the Oakland Hills where we dwelt for almost ten years. Juanita gave advise to the Love Lorne on the phone. At thirteen, Christine would try to be much older then she was. She would make up horrific stories about her dysfunctional boyfriend or husband. Juanita did her best to sort out the mess. As fate would have it, two terrible biographies, and two movie scripts were authored about Christine Rosamond Benton, one written by our kindred, Carrie Fisher. Elizabeth Rosemond Taylor and I share the same great, great, great grandfather. Much of what is written about Christine by outsiders, is fabricated. Is this the curse of the White Witch? Elizabeth Maude “Lischen” or “Lizzie” Cogswell married George Miller. Lizzie was the foremost literary woman in Oregon. On Feb. 6, 1897, Idaho Cogswell, married Feb. 6, 1897, Ira L. Campbell, who was editor, publisher and co-owner (with his brother John) of the Daily Eugene Guard newspaper. The Campbell Center is named after Ira. The Wedding of John Cogswell to Mary Frances Gay, was the first recorded in Lane County where I registered my newspaper, Royal Rosamond Press. Idaho Campbell was a charter member of the Fortnightly Club that raised funds for the first Eugene Library. George Melvin Miller was a frequent visitor to ‘The Hights’ his brothers visionary utopia where gathered famous artists and writers in the hills above my great grandfather’s farm. 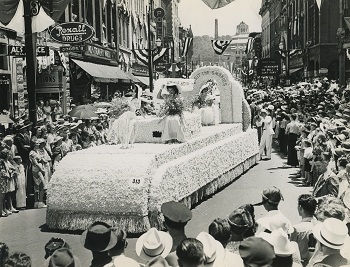 The Miller brothers promoted Arts and Literature, as well as Civic Celebrations. Joaquin’s contact with the Pre-Raphaelites in England, lent credence to the notion that George and Joaquin were Oregon’s Cultural Shamans, verses, he-men with big saw cutting down trees. Six years ago I founded a blog named after Joaquin’s newspaper the Eugene City Democratic Register ‘The Bohemian Democratic Register’. That blog crashed several year ago, and was replaced by Rosamond Press. 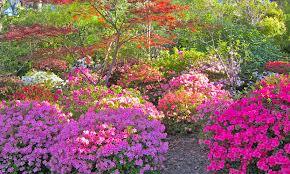 The name, Rhododendron, means ‘Rose Tree’. With the union of the Miller and Cogswell family we have the Sleeping Beauty Princess, Rosamond, awake alas, in a Progressive State that once celebrated it ties to Europe. It’s time to rewrite Oregon’s INCLUSIVE history, and bid folks from all over the world to behold our Rose Tree heritage. Rhododendron (from Ancient Greek ῥόδον rhódon “rose” and δένδρον déndron “tree”) is a genus of over 1,000 species of woody plants in the heath family, either evergreen or deciduous. Most species have showy flowers. Lane County Historical Society records of the period note that “coastals” (as they were called by city folk in Eugene) were “looked down on.” To earn respect—and much needed tourist dollars—an idea was born. “I don’t know who or how, but someone thought we could attract visitors and tourists with our colorful rhododendrons,” explained Laura Johnson Miller in a 1975 recorded interview. Johnson Miller, at 15, was crowned “Queen Rhododendra” in the first festival in 1908. In later years, she became the wife of George Melvin Miller, one of the Florence pioneers who helped start the festival. During that first festival, Miller recalls a clam bake on the beach, a big parade, and a Grand Ball, as well as a “royal fleet of boats” to carry the “royal party” down the Siuslaw River to Old Town for the official crowning of the queen. 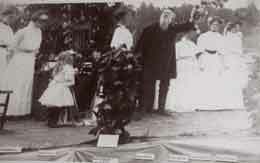 George P. Edwards was mayor of Florence at the time, and he presented the new queen with the key to the city that was carved out of rhododendron wood. Over the years, there have been many other notable grand marshals, including Oregon author Ken Kesey. 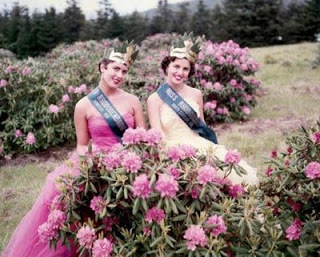 In fact, the theme of the 1979 Rhododendron Festival was the same as the title of Kesey’s book Sometimes a Great Notion. This house in the Rural Gothic style, mentioned in last Fridays post, was built in early 1884 by John Cogswell for his daughter DeEtta on the corner of 3rd and Pearl at the foot of Skinners Butte, next to the Dr. Thomas Shelton property. DeEtta became ill and died in early 1885 at age 25. Her sister and brother-in-law, Lischen and George M. Miller, purchased the house in August, 1885. 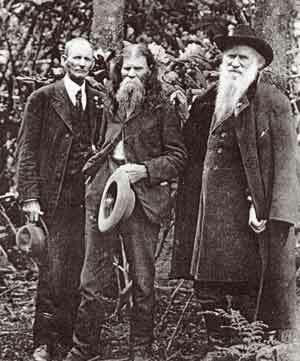 George was a brother of Joaquin Miller, famous “Poet of the Sierras”. 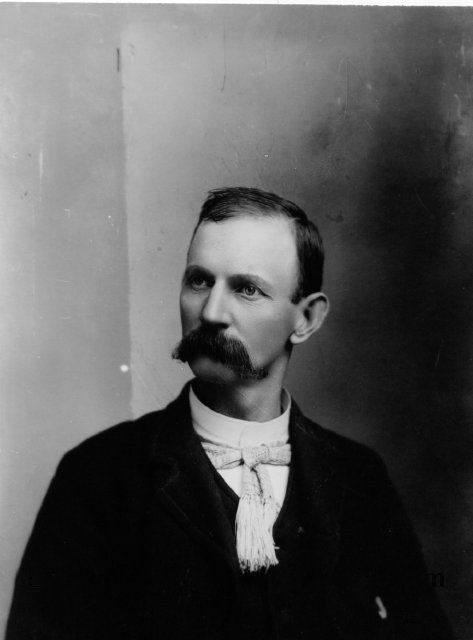 Educated as a lawyer, George also became a real estate developer who became known as the “Prophet of Lane County” He advocated a trans-continental highway from New York to Florence, Oregon; designed a flying machine in 1892; platted the town of Fairmont; and laid out the road to and founded the coastal towns of Acme and Florence. The house was moved by horses, on log rollers in 1909 to its current location, at 246 East 3rd Ave., where it has been beautifully restored, decorated and maintained. 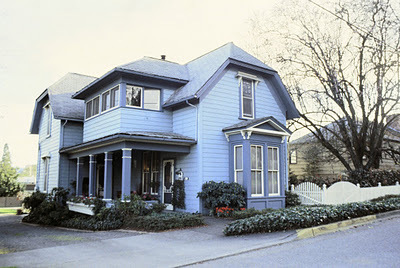 This is an other Cogswell house, built in 1892 for Clara Cogswell and her husband E.H. Ingram. It is one of the earliest Queen Anne style structures in Eugene and retains much of its original detailing. As can be seen in the early photo the house originally had a smaller porch with Eastlake/Queen Anne detailing. A corresponding side porch on the east side of the house still remains. The larger craftsman style porch was added circa 1910 greatly increasing the visual impact of the house. In later years the house was owned by Emil Koppe who was President of the Eugene Woolen Mills. The original carriage house circa 1895, still stands behind the house and was shared by Emil’s son Paul who built the house due east of his parents home in 1926.
resided in Portland 13 years ago. She is survived by her husband. 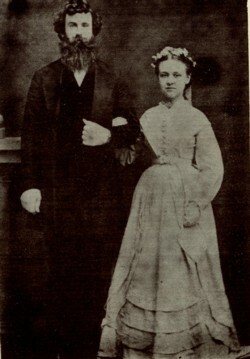 Mary Frances Gay and her groom, John Cogswell, on their wedding day, October 28, 1852. Theirs was the first marriage recorded in Lane County, Oregon. Mary’s father brought her wedding dress from Portland. Friends came from as far away as fifty miles in a rainstorm to attend the wedding. MARY FRANCES GAY COGSWELL, for whom this cemetery is named, was the eldest daughter of Lane County, Oregon pioneers Martin Baker Gay and Ann Evans (Stewart) Gay. Mary Frances Gay was born in Missouri and traveled the Oregon Trail in a wagon train with her family in 1851. She married native New Yorker John Cogswell on October 28, 1852. Theirs was the first recorded marriage in Lane County. They had nine children, with just four living to adulthood. Their two young daughters, Florilla and Mary Anne, were the first two burials in the cemetery in the fall of 1857. This cemetery is located between Eugene and Creswell, “in the shadow of Spencer Butte mountain.” The Mary Gay Cogswell Cemetery is mentioned in the book by Lois Barton entitled, “One Woman’s West: Recollections of the Oregon Trail and Settling of the Northwest Country.” This book was based upon the diaries of Martha Ann (Gay) Masterson, who was Mary (Gay) Cogswell’s younger sister. The great-great-granddaughter of David Green Gay, Pam Wirkkala, has requested that the directions and GPS coordinates to this cemetery be removed from this page. She maintains that, “The “Mary Cogswell cemetery is a private family cemetery still in use, and as such the family prefers that the location not necessarily be so vividly described on the Web.” This is despite the fact that the information is available elsewhere on the Internet, as that is where it was obtained for this page originally. However, unless other Cogswell/Gay/Masterson descendants request otherwise, this lone person’s opinion and request has been honored. The third child and third daughter of John Cogswell and Mary Frances (Gay) Cogswell. She married George Miller on May 28, 1885. George J. Buys and A. Eltzroth purchased the paper in December 1869, and six months later bought out Eltzroth. Buys sold the paper eight years later to John R. and Ira Campbell, who would remain owners for 30 years. In 1890, the Eugene Guard became a daily newspaper. Charles H. Fisher took over the paper in 1907 and published it until 1912 when E. J. Finneran purchased the paper. Finneran bankrupted the newspaper in 1916, partly due to the purchase of a perfecting press that proved too expensive for such a small newspaper. The University of Oregon’s journalism school briefly ran the paper during the receivership under the guidance of Eric W. Allen. In 1893 a group of enthusiastic women formed an organization called the Fortnightly Club with the object of bringing together others interested in cultural pursuits. The first of their projects was the donation of an assortment of books and the acquisition of a vacant room in a downtown store building where they opened Eugene’s first reading room. This project blossomed into a plan to establish a library. They succeeded in interesting Andrew Carnegie, industrialist and philanthropist, and with the help of private gifts and the City of Eugene, the project came to great success with the establishment of Oregon’s first Carnegie Library at the corner of 11th Avenue and Willamette. The Fortnightly Club’s 657 volumes became the nucleus of the Eugene Public Library collection. 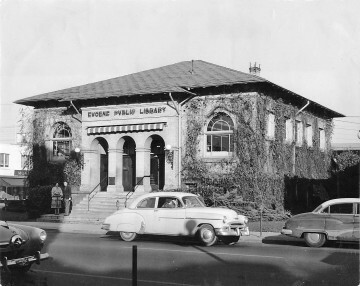 The Club continued to be important in gathering public support when the crowded and cramped Carnegie Library was replaced in 1959 with Eugene’s second library at 13th Avenue and Olive Street. The Fortnightly Club also funded the Library’s first bookmobile in 1959. The Fortnightly Club continues to fund memorial books for the new Eugene Public Library and recently gifted a major window for the Library. Today’s library users thank the Fortnightly Club and those enthusiastic women from 1893 who began the planning for our community library in Eugene. They would be pleased with what they helped us build. If Ed can contribute any knowledge of Fairmount and George Miller, I sure would appreciate it.